In 2005 the Parish Council commissioned a Parish Plan which included recommendations to provide better facilities in the playing field for young people, particularly as it had been overlooked for so many years and badly in need of renovation. The council responded with an eight year plan to set aside £5,000 each year – the most they could afford – with perhaps additional funding of grants and donations to revamp the recreation area. In 2009 the council were made aware of a government scheme called ‘Playbuilder — Local Play Spaces’ administered by Northants County Council (NCC) which offered grants up to £50,000 to provide more challenging play equipment for 8-13 year olds. Consequently a Project Management Team led by Neil Jagger prepared and submitted a detailed Project Plan Application to the NCC Grants Panel for a grant by the closing date of 30 April 2009. This involved the study of an abundance of guidelines and associated literature, consultation with children and young people of the village and the inevitable form filling. At the same time the response to a questionnaire delivered to every household requesting their choice of play equipment was more than encouraging. Unfortunately the application was unsuccessful but was re-submitted after further consultation, and in spite of government cutbacks it was finally accepted by the NCC Grants Panel in February 2010 and the work of renovation began. During this period, a grant from ‘Awards for All’ was obtained to replace with compacted gravel pathways the very uneven slopes leading to the area. Long term durability for the play area was paramount. The concept, built around the people’s requirement was to retain a grassy ‘Games’ plot, provide an ‘Adventure’ surround, enhance the existing but popular items, create a ‘Tots’ area and finally to set aside a ‘Social’ area where residents/families could relax. 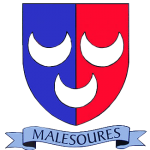 Based upon this appraisal, three layouts, with corresponding prices, were obtained from suppliers of play equipment and the proposals were displayed at the village hall and on the MMPC website for comment. During the years 2009/11, the Project Team worked hard to complete the task, having once acquired the financial backing through grants, a generous donation and from MMPC funding, totalling almost £87K. After the placement of contracts, all the suppliers worked well in support of the undertaking, including Sutcliff who installed the play equipment and Flowercraft who assisted in the selection/layout and provision of trees etc. The Forestry Commission also generously donated a number of very large oak tree trunks to add to the overall ambiance. Picnic tables and benches, play equipment for the 8 to 13 year old and the tiny tots have been installed, the existing equipment repainted and the general area tidied and landscaped with numerous trees and shrubs. 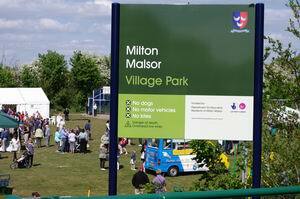 A ‘Grand Milton Malsor Village Park Gala Day’ was held on the afternoon of the 2nd May 2011 to celebrate the completion. 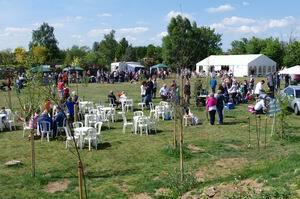 The event was very well supported by stallholders both commercial and local organisations and was enjoyed by many village participants of all ages. The park continues to attract numerous visitors and such popularity makes the volunteer project team’s two years of hard work suddenly most rewarding. MMPC Project Team Leader Neil Jagger prepared a full Project Report which includes mention of the many trials and tribulations throughout the project – it is well worth reading by anyone wishing to undertake a similar venture! Of course ‘The Village Park’ is there for all to enjoy, but it doesn’t stop there as the work is ongoing in terms of upkeep and replacements in years to come!